I think "games as couture" will be the easiest system here to enact because it is still about paying highly specialized craftspeople a lot of money to make something that makes you feel special. The "game as marriage proposal" is already a thing, so I don't think this is too far off. Maybe for your next wedding announcement or birthday invitation, you should commission a small web game from an indie, and maybe it'll communicate something special about the occasion that a piece of paper cannot? 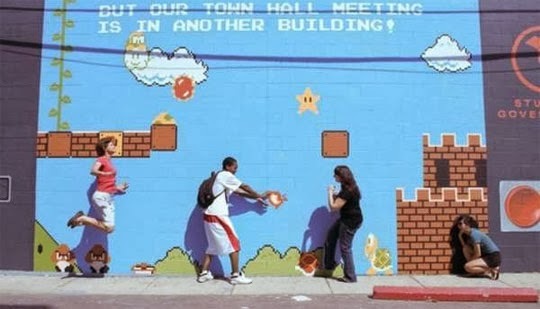 Games as murals. A mural is a large piece of art to celebrate a community. Murals are usually huge so that they require more than one person to paint; the entire community must get involved. I think the large semi-modular systems of video games are well-suited for something like this: some part of a community can record and mix sound effects, another can compose and record music, another can take photos for another part to paint backgrounds and characters... a mural is a large art project, freely available to anyone who wants to enjoy it, produced by a neighborhood to represent the story that neighborhood tells itself. One stunning example of a "game as mural" that immediately comes to my mind is Love Punks, a side scrolling adventure made with a gang of 9 year olds in Western Australia. It has an amazing energy to it, and captures something about their local community that not-art can't -- it demonstrates that this is how these people feel about their home, and this is what they're about. Or maybe you can interpret "mural" in terms of distribution: large, public, and free games, as run at the outdoor play festivals like Come Out and Play in New York City / San Francisco. Games as crafts / gifts. 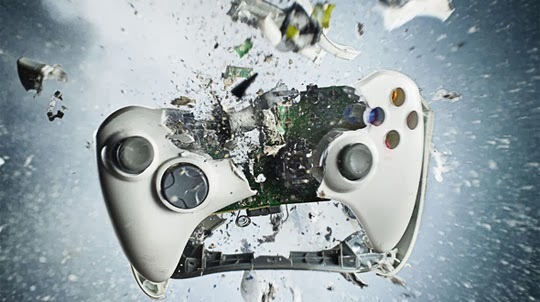 Very few people take game development classes for fun; my students are usually intent on becoming career game designers. I would argue that generally, many "amateurs" who take up game development are intent on making it their careers somehow, and this is what the indie developer "art of making it" or the AAA dream of "breaking in" is about. But what if we never assume that game development will sustain us, and just take it up as an arts and crafts hobby, a fun way to make small things for our friends? 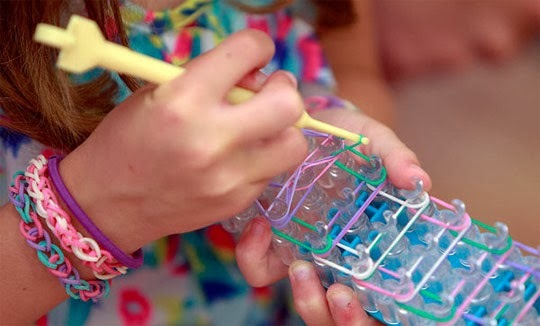 The other day, I visited my niece and she was obsessed with this toy called Rainbow Loom -- which is a board with specialized pegs designed for braiding bracelets and necklaces using rubber bands. Look at the colors! A lot of the appeal of crafts (or cooking, or baking) is in the process of making gifts for other people. My niece was excited that I was there because it was an opportunity for her to play with rubber bands AND give me a thoughtful, custom, made-to-order, handmade gift. Every time I'm in San Francisco for GDC, I've started up a tradition: I work on a game I'm making about the very people who let me crash on their couch. I ask them what's going on in their lives and try to capture the way they talk in the in-game dialogue, I incorporate inside jokes and shared moments to celebrate our relationship -- and I never intend to sell this game or even distribute it outside of this circle of 5 people. To me, what's important about this thing is that ONLY a handful of people play it! Unlike couture, there's no pretense of craftsmanship or commercial value: the thing is intrinsically valuable because you made it and it was for them. This framing isn't financially sustainable: you can't make constantly make games for people and give them away for free, and still manage to eat food and pay rent. However, I do want to fight the idea that making games for free is somehow "giving up" -- because it's not. Best of all, we don't need anyone's permission to start thinking of games like this, or to imagine new frames for games. We just have to go and do it! Let's make couture, let's tailor games, let's make murals, let's make crafts and gifts. If we start performing these new frames and ways of understanding games, then we will make these things real.